There are no words to describe this…. Fans, this is a rant and a call to action. Please read and spread the word. Every so often, something rises up that I did not foresee, but which is so compelling, I must act. This week, we were asked by a small rescue in the South to take a couple of dogs which is not unusual. I almost passed it by until I stopped to view the video they included in their email to me. That video showed footage of a government-run animal facility that was so appalling that there was no way in hell that Big Fluffy Dog Rescue was going to not act. The link to the video is https://www.youtube.com/watch?v=CC9uZ1o0Xg0 and you need to watch it. The incredible suffering of these dogs is so intense and palpable that I was left burning with righteous anger. At this “shelter”, roughly 60 dogs are crowded into open kennel runs all together. Old, young. Sick and healthy. They are starving, they are disease ridden and they have been left to die in conditions so grim that it’s a wonder anything is still alive. There are dead dogs waiting to be disposed of on the property and the stench of death in the air is overpowering in 95 degree heat. The fact that any animal should be handled this way is outrageous. The fact that these dogs are in the care of a local government and specifically, law enforcement, is so far beyond the pale that words are inadequate. The animals in their care lack voices to be heard, but I am here now to stand up and scream at the too of my lungs. If this is what our so-called nation of principles has become, I weep for us. Starting yesterday, with the help of some local vets and two very committed women, the first 15 dogs left that place and are in the care of vets right now. We have 45 to go and we need to get them out to care and safety. There is no HSUS or ASPCA to come running to the rescue here. It’s just us and a couple of concerned people in one town and the people who have caused this misery are law enforcement. The immediate goal is to get the dogs out and into care. The secondary goal is to ensure that this catastrophe never happens again. We will be reaching out to other rescues to work to find homes for these guys, but it is all about getting the dogs out to safety first. The city in all its majesty has given us until Friday to remove all remaining dogs or they will kill them. You are all going to be clamoring for details I can’t give out yet. Until these dogs are out of there and I can ensure their safety, I do not want the world screaming at the elected officials of this place. Until the extent of the atrocity is documented and the dogs are out, I will withhold that information. As soon as that last dog is out, I will allow you to join me at the metaphorical gates with the proverbial pitchforks and torches so we can demand change. It will be very important that we collectively stand our grand and support the local people in any way we can to make sure the city atones for this and takes steps to ensure it does not ever happen again. Right now what we need is money for vetting and supplies. A local person has offered up her 50,000 square foot building to house them while they are triaged and moved out, but we need to buy kennel runs and supplies to hold them. 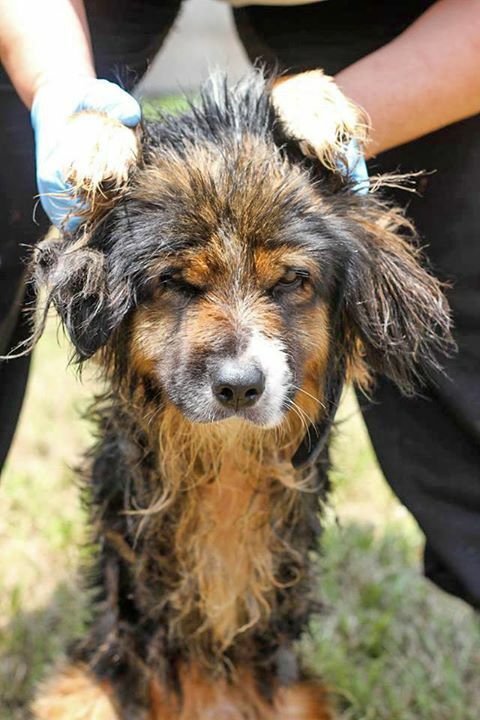 Cases like this are exceptionally expensive and soul-wrenching because the suffering of the dogs is so extreme and their medical needs are high. I estimate the total cost of this project will exceed $25,000 based on the costs we incurred in a similar hoarding case last year. We are not the SPCA and I confess I am tired of having to pretend I am the animal control facility, but the day I leave dogs to die like this is the day I hang it up and stop calling ourselves a rescue. I make my solemn vow to all of you that I will ensure that the city that did this is very, very sorry by the time this is over. This entry was posted in Furry Friends, Save a Pet and tagged animal shelters, ASPCA, BFDR, big fluffy dogs rescue, dogs, foster, rescue by tiannafonz. Bookmark the permalink.